Get out the tissues, because this tragic story currently unfolding at Pennfield High School is going to absolutely devastate you: Social studies teacher Mrs. Welter is performing a Black Eyed Peas mashup parody overviewing the Treaty of Versailles, and none of the students are taking out their phones to record it. Yikes. This is truly heartbreaking. From the moment Mrs. Welter shut the classroom door and pressed play on the karaoke track for “I Gotta Feeling,” this third-period class showed no intent to pull out their phones and record her performance to post on the internet, guaranteeing that all the work she put into the fun song will never briefly trend on Reddit nor get played toward the end of a local news broadcast. As she fired up a PowerPoint displaying the Versailles-focused lyrics she definitely spent all weekend writing and began singing, “I gotta treaty that’s going to end World War I,” not one student’s face was lit by an iPhone screen. This is the kind of thing you hate to see. It’s not like Mrs. Welter is one of the teachers who makes her students turn off their phones. Reportedly, Mrs. Welter’s transitions are all automatic and line up with the music perfectly, making it all the more unfortunate that no one has Snapchatted even a few seconds of this with the crying-laughing emoji, dooming the performance that clearly took her several weeks to prepare to only be seen by the 23 students in class. For a while it seemed like students might be waiting until the song really got going to start recording, but there’s no denying that they’re in the thick of it now, since Mrs. Welter just slid on a jacket with “League Of Nations” written on the back in iron-on letters and started flickering the overhead lights like a makeshift strobe during an instrumental break. 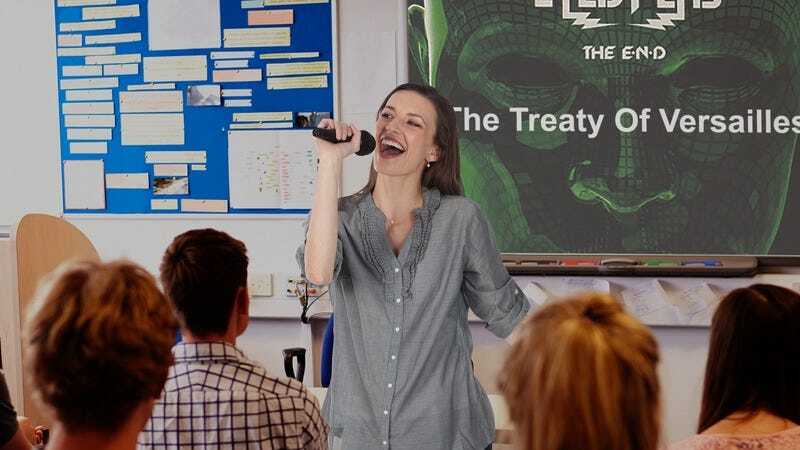 Sources confirm that things were briefly looking up when one student reached into her tote bag just as the popular gym teacher, Mr. Pletz, popped into Mrs. Welter’s classroom right on cue to sing, “Woodrow Wilson, Fourteen Points, that’s the Allies’ way-way-way-way-way! Millions died, though they tried, Germans will pay-pay-pay-pay-pay!” Unfortunately, the student merely read a text and put her phone back, even though Mr. Pletz is sticking around to provide backup vocals for the rest of the song while doing a dance with Mrs. Welter that they clearly rehearsed ahead of time. This is crushing. Seriously, if an all-star guest verse couldn’t motivate these kids to make an Instagram story captioned “So… this happened in class today” that causes random students to come up to her and say, “Nice rhymes, Mrs. W!” nothing will. Although Mrs. Welter and Mr. Pletz are still grapevining in front of the desks, the song’s only got one chorus left, and everyone’s phone is still tucked away. At this point, it seems pretty unlikely that she’ll get a write-up on BuzzFeed like, “This rapping teacher is giving us life!” But hopefully, someone hits “record” before she reaches the works-cited slide.